For those who are overwhelmed by the choices in their 401(k) plans, this article offers tips about portfolio construction from the perspective of an investment adviser. As a fee-based investment adviser, I help clients select investment solutions that improve their chances of achieving their goals. Those goals vary widely but share a central challenge: How does an adviser balance the costs and benefits while keeping the client’s best interests in mind? I have found the core/satellite approach to be the most effective way to address this challenge, especially in 401(k)s. As I will show, the process doesn’t seek the cheapest solution but, rather, the most cost-effective solution. an active satellite of cost-effective concentration. liquid (we can buy and sell with minimal impact on price). As for the satellite, it will vary depending on the strategic and tactical views of the team that constructs the portfolio. A strategic view is a long-term understanding of the global economy and capital markets. A tactical view is a short-term understanding of prices, trends, risk, correlation, and other factors that continually evolve. There are many ways to express strategic and tactical views (which I call “tilts”), and I implement them in the most cost-effective manner for clients. Nevertheless, active management costs money, for both portfolio managers and the fees for the products we choose. So, when seeking out these tilts, it’s important to remember that they must have a positive cost/benefit for the client. Fortunately, because we’re using only active management in the satellite, the overall cost to the client is minimized. 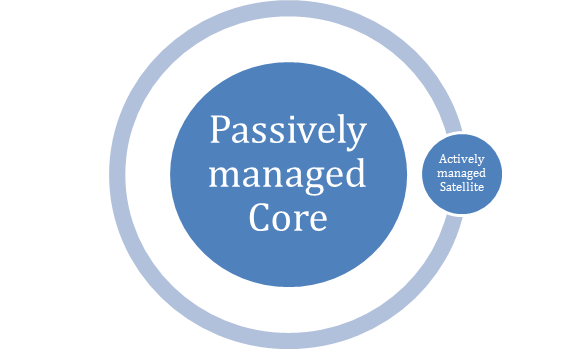 Thus, a core/satellite approach is one way to combine active and passive management in a way that is in the client’s best interests. Exhibit 2 offers a bit of comic relief. 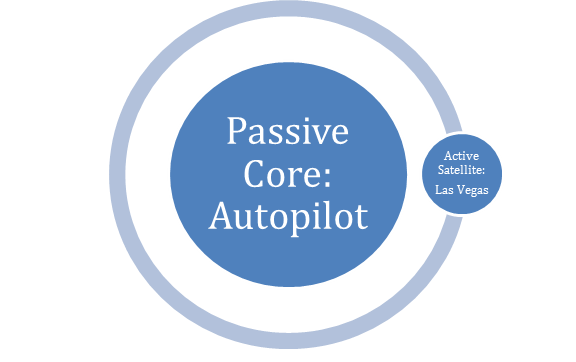 Here, the passive core is on autopilot, with no changes ever made to the investments. The autopilot portfolio assumes no change in capital markets, no rebalancing, no change in client goals, and no effort whatsoever to look after a client’s best interests. This is a parody, of course, but it is how some clients feel they are treated by their investment adviser. As for the satellite portion of Exhibit 2, the adviser goes to Las Vegas and puts everything on black. Although this is certainly not most people’s idea of active management, there is a grain of truth in it: An adviser who merely chooses the product with the highest returns during the last 12 months is speculating with the client’s money. The same is true of an adviser who chooses a “black box” strategy that is not just complex but also mysterious and unpredictable. Investing without due diligence is gambling, which is fine for the casino but not so good for retirement portfolios. Now that we have had our little break, let’s get back to work. The blending of active and passive management is also called blending alpha and beta, which is another way of describing the core/satellite approach. Alpha means beating the market, or outperformance in risk-adjusted terms; beta means matching the market, be it stocks, bonds, or some other asset. At Right Blend Investing, we have a simple way of blending alpha and beta for 401(k)s, as shown in Exhibit 3. 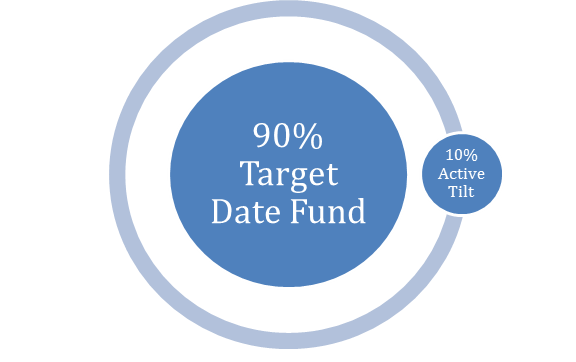 In Exhibit 3, a target date fund is the core of the 401(k). A target date fund offers a blend of stocks and bonds that provides low-cost diversification. The target date fund becomes more conservative as the client ages, gradually shifting the asset allocation from stocks to bonds. For example, Vanguard provides a range of target date funds; the cost of each fund is about 0.20%, reflecting Vanguard’s passive approach to investing. Many target date funds have been approved by ERISA as the default choice for employees. In other words, if an employee does not enroll in the company’s 401(k) plan, the plan is permitted to automatically choose a target date fund (or a “life-cycle fund” or other balanced fund that meets the criteria for a Qualified Default Investment Alternative) for the employee. This is a long way of saying that a target date fund is a good place to start when doing retirement planning. It may not be where you finish, but it provides an objective benchmark. Benchmarks are essential to the process because they allow clients to know whether they are on track. The purpose of this article is not to promote Vanguard, passive investing, or target date funds. But every investor needs to have some kind of benchmark with which to measure success. You may beat the benchmark, or you may fall short, but at least you have some standard with which to measure success. The market downturn in 2008–2009 decimated 401(k)s and left investors with psychological scars. Not only did markets collapse, but even diversified portfolios performed poorly. This downturn, combined with a decade of poor returns on stocks, led many investors to abandon not just modern portfolio theory (MPT) but common sense as well. MPT claims that investors can reduce risk and build better portfolios by diversifying among different assets. It is beyond the scope of this article to mount a defense of MPT (including its limitations and proposed improvements). But my experience suggests that it is much easier to criticize than to create, and most investors are well served by a healthy respect for diversification and long-term investing. In this period of low interest rates, certain high-yield products are attractive, such as emerging market bonds and some REITs. But this article is not the place for such recommendations, which change rapidly and vary according to the client. Suffice it to say that high-yield products are one way to complement a target date fund with active management. One of the advantages of taking a core/satellite approach with 401(k)s is that it allows the client to see the bets quite easily. The client can see the benchmark, which is a target date fund, and two or three other investments. This is pretty simple for the client to monitor and does not overwhelm the client with too many funds or too many positions. Each fund is reported on the statement, and the satellite positions are either working or not. This approach focuses the entire discussion on “what’s working, what’s not, and what are we doing about it.” This is a very clean way to run portfolios for most 401(k) accounts. In fact, I chose a streamlined core/satellite approach for dealing with the cold, hard reality of suitability. 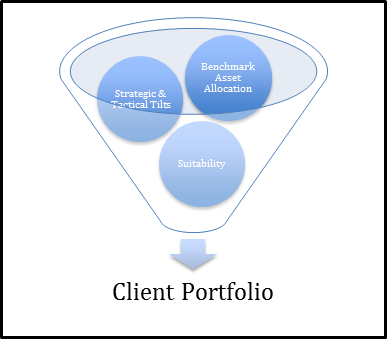 As shown in Exhibit 4, client suitability is the final element in all portfolio construction. Once a benchmark and an investment strategy are decided upon, the only remaining issue is client suitability. Obviously, a client’s risk tolerance is critical, as are the other elements on every investment application (time horizon, tax status, liquidity needs, etc.). I have found that a client’s risk tolerance usually changes over time, particularly if there is ongoing education and interaction with the adviser. As clients become familiar with new solutions, they are often willing to tolerate more risk in order to achieve their goals, Moreover, as their relationship with their adviser deepens, they are willing to consider new products and new strategies. And events such as births, deaths, and divorce often require a complete reassessment of goals. Finally, a sharp drop in the market often reveals a client’s true risk tolerance in a way that no questionnaire can ever do. All these factors are reasons for a client’s risk tolerance to change, and so the process described in Exhibit 4 begins again, with new goals and a fresh start. I believe that client suitability is critical to the success of any investment strategy. A client who doesn’t understand a strategy is very likely to bail out at the bottom. I have seen it happen time and again, and I do not expect human nature to change in my lifetime. The simplest thing for a client to do when something isn’t working is to sell it—problem solved. This may work as a risk control measure in certain circumstances, but it is a terrible discipline for asset allocation. become suitable for alternative investments (e.g., allocations in real estate, commodities, long–short strategies, and managed futures). Thus, although a client may start with a solution that is “simple, safe, and cost-effective,” that is not where the client is likely to finish. As markets change and new solutions emerge, the adviser will continue to offer new ideas. And if the adviser provides ongoing client education, as well as sensitivity to the client’s evolving needs, the portfolio may well become more sophisticated than the one I have outlined here using the simple core/satellite approach. Great perspective and commentary. Congrats!